Ann Arbor (Informed Comment) – The dishonest smearing of Rep. Ilhan Omar (D-MN) by the Rupert Murdoch press,including the New York Post and Fox Cable News, on which the despicable Trump piled on, contains more ironies than her defenders for the most part realize. She is right. The 9/11 terrorist operation that killed nearly 3,000 Americans was the work of a small fringe extremist group, consisting of only a few thousand vigilante guerrillas out of a world-wide Muslim population of 1.8 billion. It cost $500,000. It did not have government backing. The 3.5 million Muslim-Americans fall roughly into fourths, being 25% each white, African-American, South Asian and Arab-American. White Sufis in Santa Monica, African-Americans in Chicago, Indian-Americans from Hyderabad in Maryland, and Shiite Lebanese-Americans in Dearborn, Michigan, had nothing whatsoever to do with 9/11. It was launched from Afghanistan by a motley crew of expatriate Saudi and Egyptian scruffy terrorists. When a white nationalist terrorist shoots down innocent people, we don’t blame all white people or demand that white people apologize on behalf of their disreputable cousins. I’m 66 and have never been asked by anyone to apologize for the KKK or seen white people in general criticized for failing to denounce it and take a public stand against it. These dangerous attacks on Omar by the Murdoch press and the Republican Party endanger her life. One would-be assassin has already been arrested by the FBI. But beyond that, the attacks are the height of hypocrisy. The dirty little secret is that sleezy and monopolistic press lord Rupert Murdoch, who spreads anti-Muslim hatred as an echo of the “White Australia” racist politics in which he was steeped, strongly backed Ronald Reagan in 1980. And Ronald Reagan created al-Qaeda. Reagan was fascinated by private armies, since he was hobbled by having a Democratic-dominated Congress that often forbade him to spend money on military adventures abroad. Reagan broke with the consensus of the US policy elite from the late 1940s, which was committed to containing the Soviet Union. George Kennan argued that it was not so strange that peasant societies like Russia and China had been attracted by Communism, but that it should be prevented from spreading to the rest of the world, and especially to the industrialized world. Reagan did not want to contain Communism. He wanted actively to roll it back. He was especially dismayed when leftist movements took new territory, formerly in the hands of economically conservative and pro-American dictators. He thus steamed about the Sandinistas in Nicaragua and the Communist Parcham and Khalq factions of the People’s Democratic Party of Afghanistan. 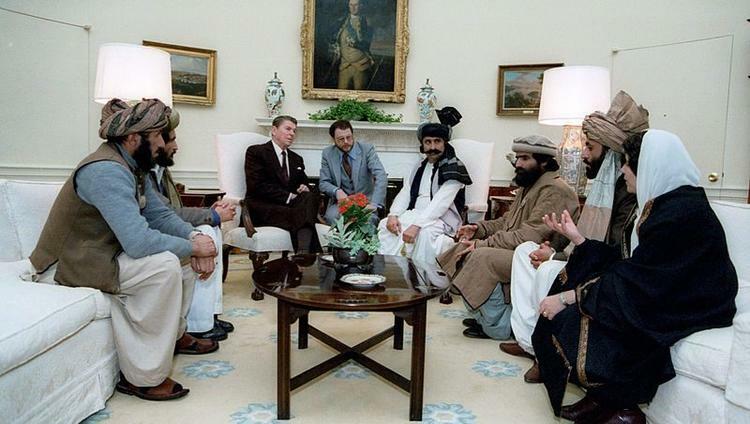 Reagan’s response in both cases was to use black money and covert operations to support private far right wing militias– the Contras in the case of Nicaragua, and the Mujahideen in Afghanistan. There were seven Mujahideen groups. Some of them were tribal. Some were extremist Muslim fundamentalist, as with the Hizb-i Islami (Party of Islam) of Gulbuddin Hikmatyar. Reagan gave them billions and arranged for Saudi Arabia to give them billions. The Party of Islam was the best funded and the most vicious. The Reagan administration also put pressure on Muslim allies like Egypt and Saudi Arabia to support the vigilante Mujahideen by promoting private fundraising and encouraging volunteers to go fight. As a result of this pressure, Egypt released from prison members of the Islamic Jihad like Ayman al-Zawahiri and allowed them to go to Peshawar. The head of Saudi intelligence, Turki al-Faisal, recruited a young socialite, Usama Bin Laden, as a fundraiser for the effort. These Arabic-speaking volunteers, established in Peshawar, fought side by side with the Mujahideen. Reagan had the CIA set up training camps for the Mujahideen in which they were drilled on weapons, explosives, and tradecraft. Although the CIA station chief in Islamabad, Milt Bearden, denied that the US trained the Arab volunteers, since the Arabs fought in mixed units alongside the Mujahideen, they would have learned CIA tactics second hand, in any case. In the maelstrom of the Reagan Jihad, Bin Laden formed first the Office of Services, and then al-Qaeda. If the Republican Cold Warriors had just put some sanctions on the Soviety Union and left Afghanistan alone, it would have become an Uzbekistan and while it wouldn’t have been pleasant, it would not likely have intervened in geo-politics. By creating a vast army of militant, radicalizing Muslims as a stick to beat the geriatric Soviet Union, the Republican Party and its financial and media backers like Rupert Murdoch opened Pandora’s Box. As for Somalia, from 1969 to 1990 it was ruled by Mohamed Siad Barre, who established a secular system of Scientific Socialism and disallowed the Muslim Brotherhood and other parties of political Islam as reactionary. Ilhan Omar was born in Somalia in 1981 under Scientific Socialism and lived there as a child, at a time when the major project in the Greater Middle East of the US Republican Party was the destruction of secular, scientific socialism and its replacement by groups like Hikmatyar’s fascist Party of Islam and Bin Laden’s al-Qaeda. After the fall of the Soviet Union, al-Qaeda turned against the United States, giving as pretexts the Israeli annexation of Jerusalem, US severe sanctions on Iraqi civilians, and US bases in Saudi Arabia, the Muslim holy land– and it transpired that America’s staunch anti-Communist allies were ambitious genocidal maniacs happy to stab their former allies in the back. Maybe Reagan should have considered that character issue before making his alliance. So not only are Ilhan Omar and other Muslim-Americans distinctly not responsible for al-Qaeda, but Rupert Murdoch and the US Republican Party do bear great responsibility for it becoming a major player in world affairs and an organization willing and able to take on a superpower. As Noam Chomsky has correctly pointed out, the US Republican Party is the most dangerous organization now operating on the face of the planet earth. It is increasingly a fascist party wedded to the themes of white nationalism, and it is determined to burn every last lump of coal to destroy the earth’s climate, for the profit of its moneygrubbing billionaires. It was the billionaires’ horror of an economically egalitarian doctrine like Communism that stampeded them into the warm and ultimately explosive embrace of Usama Bin Laden in the first place. Communism was bad. Al-Qaeda was worse, and Ilhan Omar’s people knew that when she was a little girl. US Republicans did not.